Late night talk show host Conan O'Brien is spending a week in Israel filming a Conan Without Borders travel show to be aired in September. We're following his antics as he boards an El Al plane and brings his comedy to Israel. In this video clip, second of the series, he has an encounter with the toilet on an El Al plane in flight. 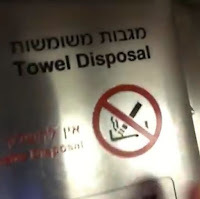 After spending an hour and a half in the toilet to get a suitable video sequence, he offers some very creative interpretations of the Hebrew words on the towel disposal bin and lotion dispenser. Meanwhile, an El Al passenger, not known for patience, bangs on the door repeatedly to try to gain access. We'll be sharing more of his funny videos with you over the next few weeks. Next episode: The Tel Aviv skyline and shakshuka. ...and do you really think that's funny? Nobody should be ashamed of not speaking Hebrew but this barbarian of hohma should really be ashamed of mocking. only a center of trivia. Please stay away from such poor contributions. Conan is a very popular American TV star who has done a lot to present Israel and Jewish life in a good light over the years. He is making a TV special on his trip to Israel and the Israelis are loving it as you can see in this Washington Post article and many others in Israel and the USA. ...and frankly, neither this gentile type "humorist" approach being placed in the same website where Jewish humor giants like W.Allen, M.Brooks or J.Lewis (just to name a few) - and of course the great Mickey Katz are represented with their "sticks". A Joke to Start the Week - "The New Citizen"
A Joke to Start the Week - "Ours is Prettier"
A Joke to Start the Week - "Mozart on the Bus"